Good news! Marketing technology — as a sector and a discipline — is starting to mature. “Massive vendor consolidation?” you might ask hopefully. Well, not necessarily — at least not in aggregate. I’ll let you know if we’ve finally passed peak martech (as I not-quite-predicted last year) once I start working on the 2017 version of the marketing technology landscape. But ancedotally, I continue to learn about new marketing technologies every week. 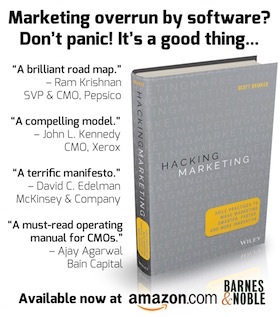 In computer science lingo, the marketing technology landscape is still O(large). One way that it’s maturing though is the increasing availability of year-over-year studies — the same survey conducted by the same research group multiple years in a row. These help reveal how marketing technology practices are evolving over time. I know of several such studies underway at the moment. So before the end of the year, we’ll have quite a bit of longitudinal data on our space. The chart at the top of this post is clipped from their latest report, and it shows a stunning inversion of marketing technology utilization from Ascend2’s study on this topic last year. In their 2015 report, only 9% of marketers had a complete, fully utilized martech stack. That’s a massive 255% jump in complete, utilized marketing stacks! On the other end of the spectrum, last year 34% reported that they neither had the tools they need nor fully utilize what they already have. This year, that number has dropped by more than half to 15%. This signals that the discipline of marketing technology management is shifting beyond “tool selection” and “tool operation” as its top challenges. Which is a good thing, because those tasks, while important and necessary, are inherently an intermediate step to fulfillment of the real mission: delivering marketing value to the organization and its customers. An impressive 40% of participants say their marketing technologies are extensively integrated. And another 55% say that their tools are at least marginally integrated. Only 5% say their marketing technologies are not integrated. This matches simiar data I’ve seen from other studies that are soon to be released, as well as anecdotally what I’ve heard from hundreds of marketers over the past year. Marketing technology integration is still non-trivial, but it’s not the barrier that it once was. Most vendors in the space have invested tremendous effort in simplifying their interfaces to the rest of the martech ecosystem, and it’s paying off. The continued rise of iPaaS cloud integration services is also giving marketers a lot more options for connecting the best-of-breed pieces together in a way that is tailored to their business. And the mainstreaming of marketing technologists has helped too. Most marketing teams now have embedded technical talent to enable them to orchestrate these tools more effectively. As “integration” starts to become less of a challenge, it’s interesting to see what pops to the top of the list of most significant barriers to achieving marketing technology goals: strategy. Okay, “inadequate budget” is actually at the top of the list. I discount that slightly because, after all, who doesn’t need more money? However, I am certain that there are legitimate budgeting difficulties, as both (a) the scope of marketing has been growing faster than the size of its resource pool, and (b) even rearranging budget within the marketing department can be a painful and political process. But just behind it is the “lack of an effective strategy” as a barrier — ahead of integration. Finally, it’s worth noting that 90% of this study’s participants report that effectiveness is increasing for their marketing technology used. Nearly a third, 31%, say it’s increasing significantly. These are all good signs of marketing technology maturing. It’s definitely worth picking up a copy of the report from Ascend2 to read the rest of what they learned. Interested in more marketing technology insights? Don’t miss MarTech Europe in London, November 1-2, featuring over 25 vendor-independent, educational sessions on the interplay of marketing, technology, and management. Hi Scott. Thanks for the shout-out, although I’m not nearly as amusing as you suggest — at least, not intentionally. More substantively, I’d take some of the report findings with a boulder-sized grain of salt: it doesn’t seem possible that the percentage of companies with all tools fully utilized could jump from 9% to 32% in one year. Change just doesn’t happen that fast. In fact, I’m not sure that any company could honestly say it had a complete stack or full utilization: surely there is always something more to buy and do. Econsultancy had a really good perspective on this in their recent report “Customer Recognition: How Marketing is Failing at its Top Priority” which founded that 43% of organizations reported having a single customer view but only 12% had the required technology in place. While they were too polite to say so, the companies who say they’ve built a complete view without the technology are either magicians or fooling themselves. I’m all in favor of magic but will still vote for the latter explanation as more likely. It may be that many respondents to the Ascend2 survey are in a similar state of reality avoidance. A sensible word of caution, indeed! I agree — the exact numbers in any of these studies are subject to any number of faults, from selection bias of who participated in them to, as your Econsultancy example demonstrates, questionable internal consistency in each participant’s perceptions of their world. Stepping back, I don’t doubt that we’ve got a long way to go still. But if there’s more productive order to the chaos this year than last, I take heart that we’re headed in the right direction.